Downing a few glasses of milk a day is an easy way to get your recommended three cups of dairy a day, but it is possible to overdo it. From weight gain to stomach upset, the side effects of milk are varied, and some people never experience any problems even if they drink milk with every meal. If you choose your milk from the whole-fat section of the dairy case, you could be unwittingly adding excess calories to your diet that could lead to weight gain. Whole milk contains 149 calories per cup, while skim milk has just 91 calories per cup, so switching to skim is a good strategy if you suspect that frequent milk consumption may be affecting your weight. Some people have lactose intolerance, a condition in which the body can't break down lactose, the primary sugar in milk. The symptoms of lactose intolerance include nausea, abdominal cramping, gas and diarrhea. These side effects develop between 30 minutes and two hours after consuming milk. This condition develops over time, so even if you could drink milk without side effects when you were a child, you could develop lactose intolerance in adolescence or adulthood. 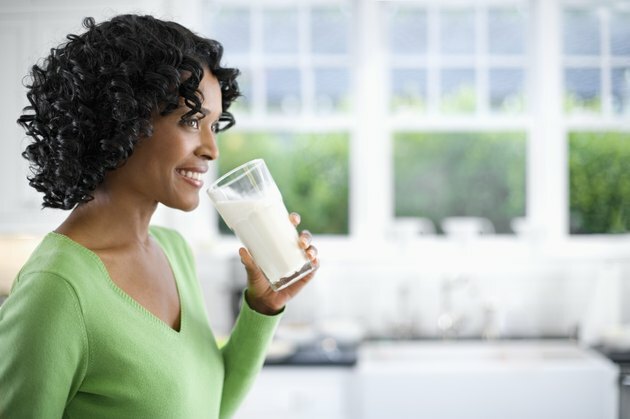 Some people experience lactose intolerance symptoms even if they have only a few sips of milk, while others can drink a glass or two before experiencing symptoms. A milk allergy isn't the same thing as lactose intolerance. Instead of having problems digesting milk, someone with an allergy actually has an immune response to the proteins in milk. Symptoms of a milk allergy include wheezing, coughing, throat tightness, upset stomach, itchy eyes, vomiting, hives and swelling. The symptoms typically start within a few minutes after consuming milk, although they can sometimes develop up to two hours later. In severe cases, someone with a milk allergy may develop an anaphylactic reaction, a life-threatening condition that requires immediate medical intervention. Milk can affect iron absorption and reduce the effectiveness of iron supplements. While this is generally not a major health issue for adults, small children who consume too much milk can become deficient in iron and might develop anemia. For this reason, the Centers for Disease Control and Prevention recommend that babies under 12 months old should not be given cow's milk at all and children under 5 should be limited to three or fewer 8-ounce servings of milk per day.